It was Thursday morning and my cell phone lit up. I had a text. It was from my climbing friend Nick. I typed “14ers.com” into my browser — the go-to website for all things pertaining to Colorado’s storied fourteeners — and balked at the terrifying photos of Crestone Needle on my screen. 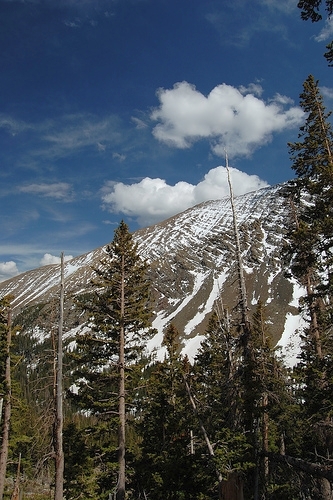 A fourteener is, quite simply, a mountain with an altitude of at least fourteen thousand feet. Colorado has 53 of them (although the number is disputed by some), and since it’s one of the most athlete-saturated states in the country (and the thinnest), attempting to hike them all is a popular goal among those in the climbing community. I already had nine of these behemoths under my belt, but after seeing what climbing Crestone Needle entailed, climbing it this weekend was out of the question. Crestone Needle is commonly listed in the “Most Difficult” category of hikes of all the fourteeners in Colorado, but I had yet to venture above the “Moderate” category. Exposed and consisting of Class 3 climbing — characterized by scrambles over craggy rocks — climbing helmets were a necessity. I didn’t even own a climbing helmet yet. Reports said it was extremely easy to lose the route on your way to the summit, and while it’s 11.25 miles long (a moderate distance for a fourteener), hikers would be gaining an unprecedented 4,400 feet of elevation. Crestone Needle was dangerously close to being a technical climb, and the other fourteeners I had successfully “bagged” were, although grueling and challenging, no more than a particularly arduous trek up a trail — a trail any fit Zumba teacher could survive. I resolved to come to a decision: No way was I doing the Needle. I grabbed my cell intending to gently sway my friend into choosing a less challenging weekend hike. “Hmmm, looks pretty scary,” I texted. I would be insane — and frankly moronic — if I agreed to climb Crestone Needle. Two days later, I woke at 3:15 a.m., five minutes before my alarm blared its tortuous sound. The night had been sleepless. Notwithstanding the atypical sweltering Colorado summer night, which rendered my sleeping bag a claustrophobic furnace, the majority of my evening was spent cowering in my tent. Outside the thin, nylon fabric, I had heard the low din of growling from several woodland creatures. It was almost certainly from a posse of raccoons, but my mind morphed these cute, rabid bandits into black bears who had caught whiff of the remnants from the previous night’s shampoo. In the dead of night, I was convinced these beasts were moments away from swiping at the flowery scented stuff with an outstretched claw, leading to certain death, or at least severe disfigurement. I roused myself from my tent, hearing Nick stir at the same time. A boisterous guy from North Carolina who spoke with a twangy, southern accent and a vocabulary of cuss words that would make a sailor blush, I had met Nick several weeks ago while climbing Mt. 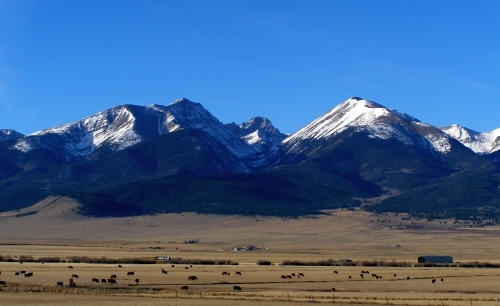 Columbia, another fourteener. He was a huge fan of Oklahoma football, and rarely walked out of his house without sporting the team’s colors (orange jacket and orange trail shoes made the cut today). He was a good climbing partner. I prepared to leave, tearing down my tent and jabbing my contact lenses into bloodshot eyes. I stuffed my backpack with water, squashed Clif bars and a rain jacket. I clipped my recently purchased helmet onto the outside of my pack. In the darkness of the moonless night, I double- and triple-checked that I had packed my sunglasses. Nick and I flicked on our headlamps and stepped onto the trail. It would be hours before we saw the first hint of sunlight peeking over the Eastern horizon. I was never a deeply religious person, but after seeing the day’s first tendrils of sunlight snaking through the clouds, I had found it. I had found my religion. You must believe in a higher power, in something greater than yourself, when the sky morphs from hues of gray to rays of orange, to red to a brilliant, piercing view. We paused from our quick clip and soaked in the light, gaining energy from the sun. I stretched my arm and blindly pawed the rock wall in search of a knobby, cold handhold. My feet were straddling a crack in the cliff plunging hundreds of feet down. I wrapped my fingers around the side of a boulder and heaved myself across the gully, bracing my shoulder against the rock. I was completely vertical, and I tried hard to stop myself from thinking about the injuries I would sustain if I fell. I had climbed much harder routes than this in a rock climbing gym — in a gym I frequently hang upside down — but out here was different. The moves are essentially the same but the stakes are much higher. I exhaled sharply and started climbing, hyperaware of my surroundings. The air was much cooler at 13,000 feet than it had been at camp and the sun was blinding. I worried my face was getting burned. We crested the top of the first gully, and the Needle came into view. The jagged, granite cliff was terrifying. Striated gray and black granite speared the sky and wispy clouds clung to the mountain’s ripped edge. A dense fog raced across the summit, alternatively concealing and revealing the peak. As I climbed, the quote ran through my mind over and over again, ringing dead-on accurate as I methodologically maneuvered my way up the rocks. I couldn’t even say that my adrenaline was surging. My movements were nearly Zen-like; I could have been underwater. The trail narrowed before the push for the summit. It was almost unperceivable, and seemed to be forged by Lucifer himself. It was steep; very steep, and I questioned the wisdom of continuing. Caught in this limbo, I wanted desperately to reach the top. I had been climbing for hours and I didn’t want to let this peak slip away from me. But then I’d look over my shoulder and see what a sketchy time I would have climbing back down. My thoughts branched out, as they had been doing frequently throughout this hike, but this time, I didn’t try to reel them back in. I questioned this over and over. “Why am I in Colorado at all?” I didn’t have roots here really—I had only been living in Boulder for a year. Self-doubt clouded my thoughts, and I struggled to push through them. I remembered the first night I spent in Boulder, lying awake on an air mattress in a strange house—jobless and friendless in this new city—so homesick and unsure of my decision to move from the East Coast that I could barely breathe. In the darkness of my subleased bedroom I had choked back tears, confused why I had felt such a palpable tug towards the West. None of it had felt right in the beginning, and every instinct I had told me to catch the first plane back to Connecticut. 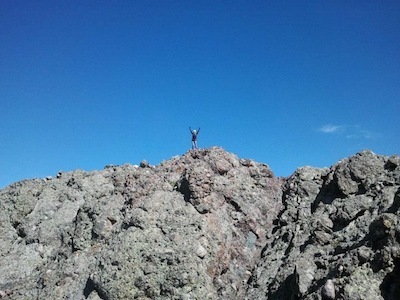 But somewhere near the top of Crestone Needle—perhaps 200 feet from the summit—I gained speed. I scrambled over the rocks, climbing on all fours. The trail was even narrower now, a chute funneling down the seam of the mountain. I could see the summit, and only a thin, rocky traverse separated me from the top. I climbed higher and higher, until suddenly there was nothing else to climb. The fog that had lingered over the mountain the majority of the day broke. Inhaling the cool air, I set down my backpack, feeling my anxiety melt away. My racing thoughts dissipated like mist. I turned to look over the mountains, back the way I had come. I could see for miles, and felt amazed at the distance I had covered since leaving Boulder the night before. Nothing had ever been so clear. Colorado was where I belonged.